We are Mike and Cheri Russell. We live in Ozark, Missouri, a small town South of Springfield and North of Branson.We live on a “Missouri Century Farm” and do our Wicker Restoration and chair caning. ❤︎ This means our farm has been in the same family for more than 100 years. In fact, on Sept 7, 2015, the farm will be 162 years old and is know as a Sesquicentennial Farm. Part of our business ran out of the Old Log Barn built in 1853. It was the oldest log standing barn in Christian County until 4 years ago. ❤︎ On Black Friday 2011, a mouse decided to chew into our electric cord and the barn burned down in just 45 minutes. ❤︎ The barn was full of all our first custom wicker pieces we had designed and made as well as our private collection of antique wicker. ❤︎ It was also full of Cheri’s family treasures Heirlooms, it was very heart breaking! ❤︎ now have added on to the family house a workshop where the major to minor wicker surgery is performed.❤︎ Some day we would like to rebuild the Log Barn back. 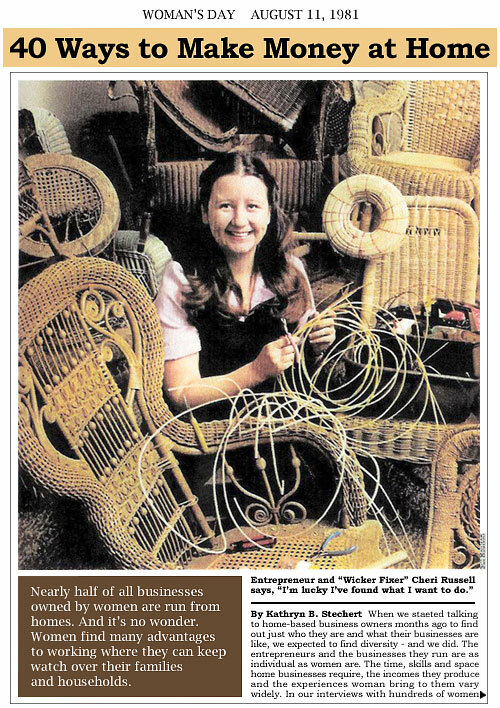 Cheri started the Wicker business in 1976 in Cocoa Beach, Florida. Later, when we moved to Washington State where my husband, Mike joined me in performing the repairs. In 1981 we moved back to my hometown of Ozark, Missouri and have been here ever since. We really love it here on the family homestead. We were lucky enough to have provided several Antique Wicker pieces to be used in the movie “Mr. & Mrs. Bridge,” starring Paul Newman & Joann Woodward, filmed in Kansas City, Missouri. 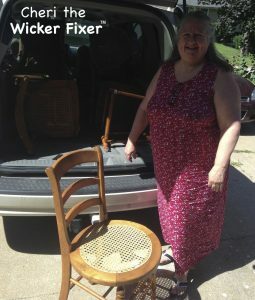 We have been listed in Richard Saunders books, one of which is “The Official Price Guide to Wicker,” in fact, Richard purchased an Antique piece we had restored for his wife as a gift. Cheri was featured in the 1981 August issue of “Woman’s Day” magazine. We have been Blessed to be in several other magazines, newspapers, Radio talk show and TV News features over the years. We have restored 1,000s of family heirlooms and look for to restoring yours or a future heirloom. Wicker has been restored from coast to coast. If you would like references, just ask. 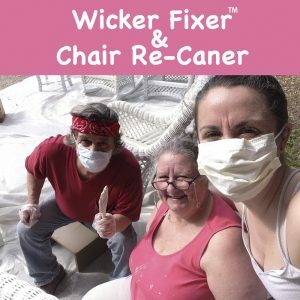 We have a saying: “Get Your Dog Chewed, Cat Clawed, Bird Picked, Family Abused Wicker Fixed Today!! ” They are our best customers! 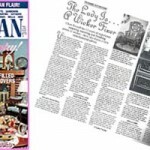 Country Victorian – Fall 1990 Please click to read “Country Victorian” article. 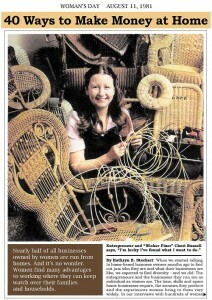 We do a lot of wicker restoration. ❤︎ all over the United States. For information e-mail or call me. Pick-up & deliveries available for a fee to the Kansas City Missouri and Kansas areas. Also Joplin, St. Louis, Columbia areas.